Wow! Two Weeks Already Gone! Two weeks since last post and it has been tumultuous roller coaster ride. DH had surgery three weeks ago, and was released from the hospital two days later. At the same time our vet informed us that Maggie, our English Springer was having issues with her liver. This week it is a son with a blown engine. Sometimes I wish for a little eventfulness in life. Because of the chaos in the house waiting for custom closets to be installed knitting has been the solace of choice. 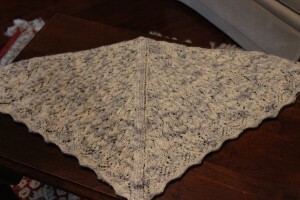 I completed a Mystery Shawlette Knit Along (KAL) from Wendy Johnson that she had on her blog in 2011 and now sells on her ravelry site, http://www.ravelry.com/patterns/library/summer-mystery-shawlette. I used a Madeline Tosh Sock Yarn in White Wash. I had tried to knit it in 2011 when it was originally released and ended up ripping it out. The knitting is complete. I had to order some lace blocking wires so that I can block it. I was frustrated by the yarn because it kept breaking, maybe because it is a single ply yarn, maybe because I ripped it out numerous times previously, I persevered and now it is knit. The next thing I started is a baby knitting junket that my local knitting shop Creative Yarns is holding. 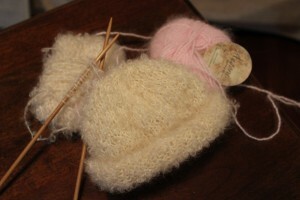 This is a weekly event where we use two books on baby items and knit. Even though I have no specific baby to knit for I started the knit along so that I might gain confidence to make garments, something I have only just started to do. I have made one pair of top-down socks gifted to my youngest sister, and one shrug for a niece. I knit most of a baby bunny hat using a Rowan Yarns freebie here: http://www.knitrowan.com/designs-and-patterns/patterns/rabbit-beanie. This is out of baby mohair Be Sweet Boucle in natural and Plymouth Angora. Just knitting it made me giddy it is so cute. I knit the hat in the round on double-pointed needles. I have two ears to complete, I seem to have lost the one I knit this week, probably at the doctor’s office and then sew them both on. I did do some sewing, after chancing life and limb to retrieve sewing machine and serger from chaos, I repaired a pair of sweat pants as they are the only comfortable clothing DH can wear at this time while healing. In addition, I worked on designing a baby quilt for a friend, J. J sent me pictures of her fabrics and I used EQ7 to design the quilt through several iterations, basically coming up with a disappearing 9-patch as it is easy for a new quilter to execute. 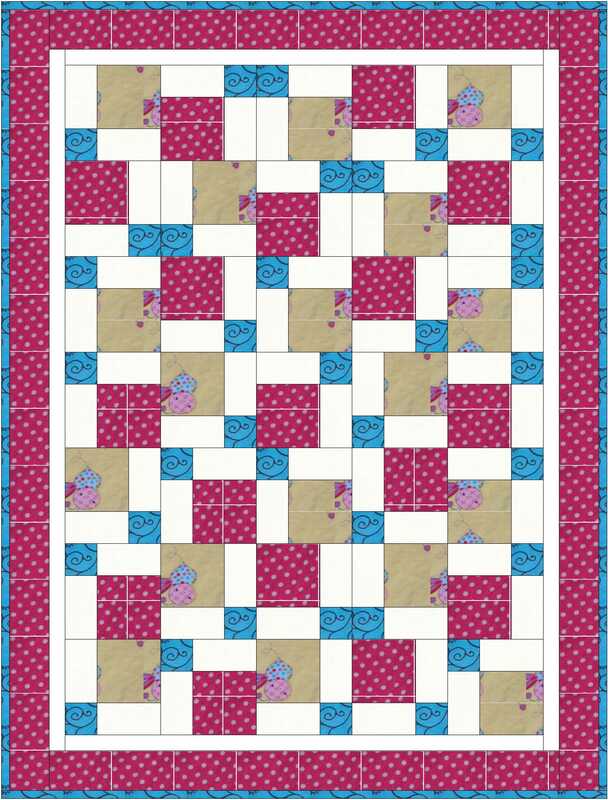 The beauty of this design is that once the basic block is sewn and cut into four blocks the quilter just rotates and flips blocks until the arrangement is pleasing to them. We added white to the mix of colors so that the quilt would pop and flow better. EQ is such an easy program to use and provides a way to test out ideas out easily before cutting fabric. It was fun to do for J. I am looking forward to seeing the completed project. Time is marching on, the beauty of Spring is all around in the flowers, the rains, and best of all the coolness of temperatures. This has been the best spring since our arrival to Middle Georgia 15 years ago. Walks have been so enjoyable and enable me to really take in the beauty of the season. I am an avid needlework aficionado that loves to learn various needlework arts such as cross stitch, needlepoint, sewing, knitting and quilting. I enjoy making these projects for family and friends and as community service projects. This entry was posted in Bernina v7 Software, Cross Stitch, EQ7, Knitting, Needlepoint, Sewing. Bookmark the permalink.